There are no comments for Alfa Romeo 3 D Badge Over 1938 Alfa Romeo 8 C 2900 B Vintage Blueprint. Click here to post the first comment. Introducing the �Wheels of Fortune� collection by Serge Averbukh, showcasing digital paintings of some of the coolest and most sought after automobiles of past and present along with amazingly digitally crafted car makers� insignia and badges (logos). 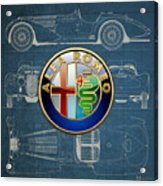 Here you will find framed and wrapped/stretched canvas fine art prints, featuring a digital painting of an Alfa Romeo 3 D Badge over 1938 Alfa Romeo 8 C 2900 B Vintage Blueprint. 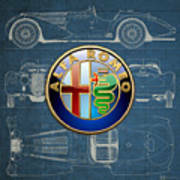 Alfa Romeo Automobiles S.p.A. is an Italian manufacturer of cars. Founded as A.L.F.A. 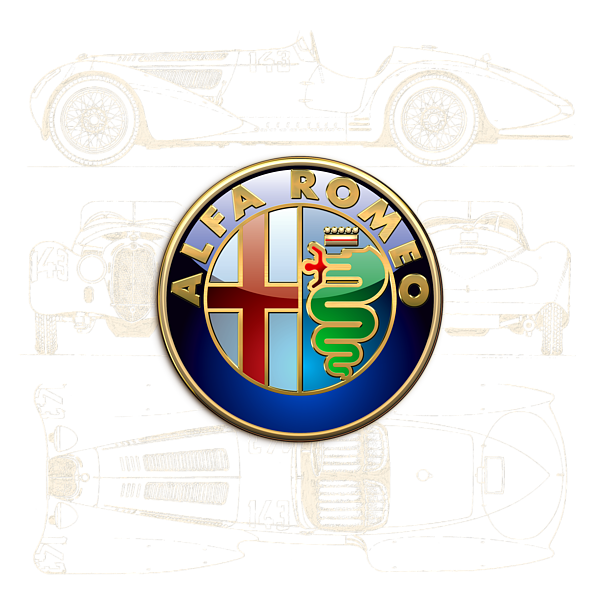 (Anonima Lombarda Fabbrica Automobili) on June 24, 1910, in Milan, the company has been involved in car racing since 1911, and has a reputation for building expensive sports cars. It was owned by Italian state holding company Istituto per la Ricostruzione Industriale between 1932 and 1986, when it became a part of the Fiat Group, and since February 2007 a part of Fiat Group Automobiles S.p.A.